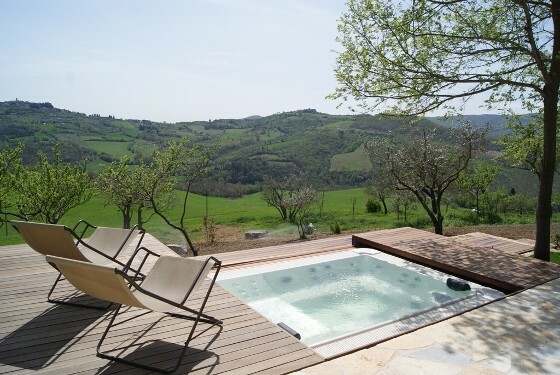 Sari Villa is a stone farmhouse overlooking the lush valley that surrounds the town of Todi. The villa has been recently renovated using materials of great taste and value, both inside and outside dominates a charming style. This wonderful Villa is the ideal place for a family or a group of friends who want to spend an unforgettable holiday in the regenerating Umbrian landscape. The decor is a perfect blend of modernity and Umbrian traditions; the living room, characterized by an open floor plan, consists of a large and bright kitchen with all comforts, it has got a fireplace and large sofa too; there is also a dining area with a door window that leads directly onto the terrace with an adjacent Jacuzzi for 8 people surrounded by a beautiful valley of fields and orchards.